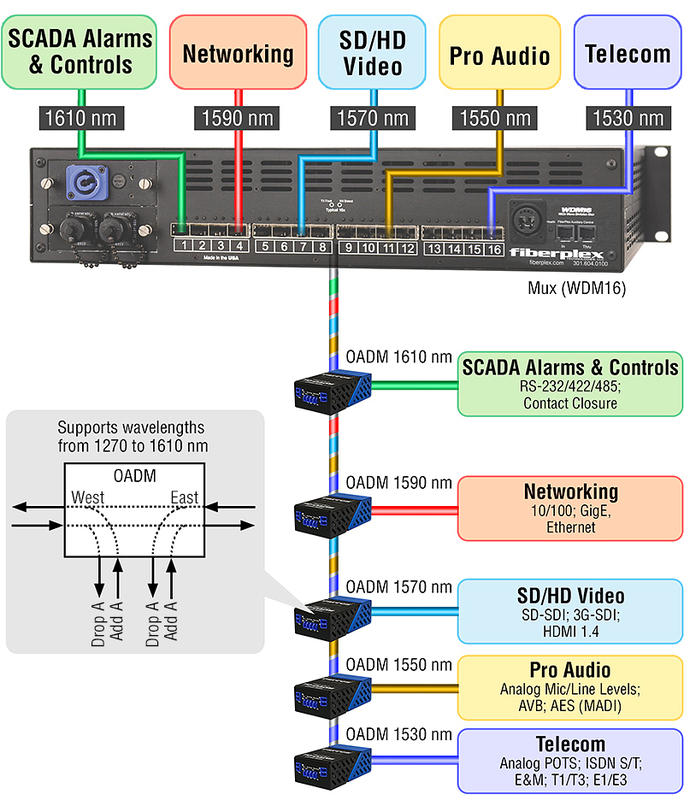 Optical Add/Drop Multiplexer | FiberPlex™ TD-OADM Series - Made in USA. TD-OADMs are a cost effective method for removing and rerouting individual wavelengths from your main fiber trunk to specific destinations. The FiberPlex TD-OADM is an optical add/drop mux used in WDM (wavelength-division multiplexing) systems for multiplexing and routing different channels of light into or out of a single mode fiber (SMF). A dedicated wavelength is assigned to any kind of voice, video or network traffic. Each optical channel (light wave) is completely transparent to traffic type, protocol and compression scheme. OADMs are commonly used in point-to-point, linear, ring, star, and mesh topologies for a large variety of applications. This device is ideal for secure networking, including SCIF communications infrastructure. Wavelength—Full ITU-T G.694.2 spectrum grid support (1270 to 1610 nm). Isolation—East/West operation with 2 x TX/RX connections for center wavelength. Extended Temperature— 23 to 149°F (-5 to 65°C) operation.